This is not a time for jokes, kids. Leaving Mexico is the hardest part of the trip. Not for any sentimental reasons, although I’ll certainly miss the insane traffic flow and purchasing power of the US dollar. No, Mexico is hard to leave because they don’t want you to. While you can skate across the border going south with no passport or any declared motive, going back into America is a completely different matter. My driver continues his habit of insane driving like he’s got a trunk full of heroin, which I don’t think is correct but I wouldn’t corroborate under oath. We go swerving down back roads, barreling towards the border while seeing the nearby lines back up every time we surface. At one point, I’m fairly sure he drove through someone’s back yard, made a right at a pinata, and swerved past a taco trailer to get back to the main road. By the way, me using the word “pinata” in that last paragraph made it feel an eentsy bit racist, Just saying. As we made his multiple shortcuts, I felt certain he was using his long-honed skills to get us past the lines. I was about half right, because he got us about halfway past the lines. 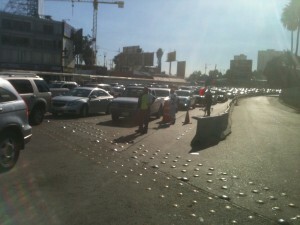 There were still a few thousand people waiting to get out of Mexico waiting in front of us. At the border, every car is stopped going into America. The Mexican marketplace doesn’t stop until the actual border, by the way. Anywhere the traffic slowed down, an impromptu market sprung up. People were pushing carts full of drinks and snacks around, there was a booth selling cell phone accessories in the middle of one of the traffic rows, and if you felt comfortable buying burritos out of an unmarked cooler, then you were all set for lunch. At one point I looked up and a guy was jogging through the bumper-to-bumper traffic, holding a 4’x6′ framed painting of the Last Supper overhead and trying to sell it. I wanted it for the comedic value alone, but there was no way I was going to fit it on an airplane. There’s a lot of time to look around, honestly, because the Border Patrol is in absolutely no hurry. Long lines are a part of the job. Every day is Black Friday to them, I doubt they even look up because the line never ends for them. You need a passport to reenter America, which I didn’t have. I did bring my birth certificate, though, and the Border Agent asked me my name, and where I was born. I didn’t want to get into a big criminal justice discussion, but even if I was going to give him a fake everything, I probably would have taken the time to memorize those things. I guess we don’t want people in America who don’t know where they were born. I’m sure there’s an Obama joke in there somewhere, but I don’t want to have to dig for it. This entry was posted on Friday, May 10th, 2013 at 6:11 am	and is filed under Musings, Travels. The entry is tagged under humor, travel, vacation. You can follow any responses to this entry through the RSS 2.0 feed. You can skip to the end and leave a response. Pinging is currently not allowed.